V-Series cases utilize a full-boxed 19" steel rack with an industry-standard square hole pattern, so hanging electronics with tab mounts is a snap. Just attach the clip nut onto a square hole with your choice of 10-32 Imperial or M6 Metric clip-nuts. Now you can get pro-grade rack mount cases in days instead of weeks. Pelican-Hardigg maintains inventory on both coasts, reducing your freight cost and transit time. 33" Classic-V Rack Mount Case is a smooth surface case with a 19" wide and 33" deep EIA standard rack. 24" Super-V Rack Mount Case is a smooth surface case with a 19" wide and 24" deep EIA standard rack. 3U, 4U, and 5U are 80 - 100 lbs. 7U and 9U are 100 - 170 lbs. 7U, 9U, 11U, 14U are 100 - 170 lbs. Wall Mounted Cylindrical shocks on V-Rack cases are attached directly to the case wall. They isolate equipment from vibration as well as impact forces. This shock mount design is used for lower payload weight applications. 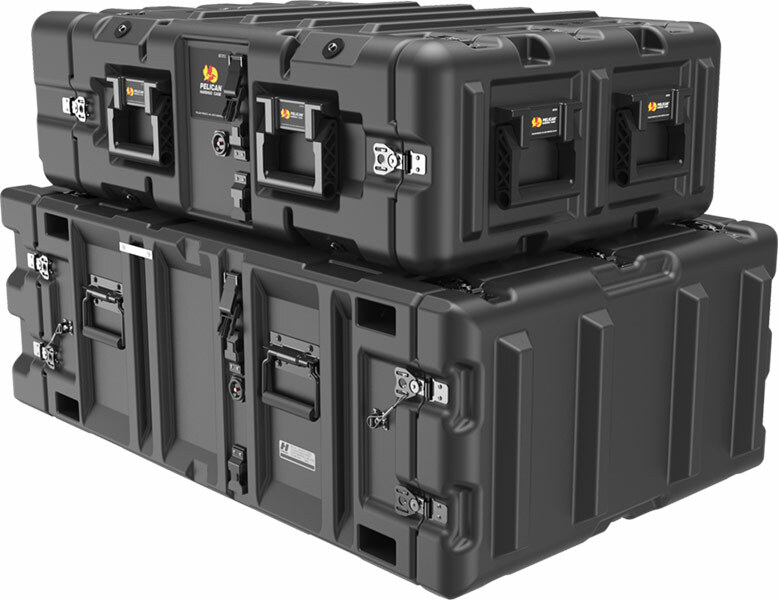 V-Series cases are an Off-the-Shelf product, in stock and ready to ship.